Senior attackers Jared Boudreau (1) and Nick Triziano (22) both notched goals in the past week as the men’s lacrosse team tallied back-to-back wins to improve to 3-2. 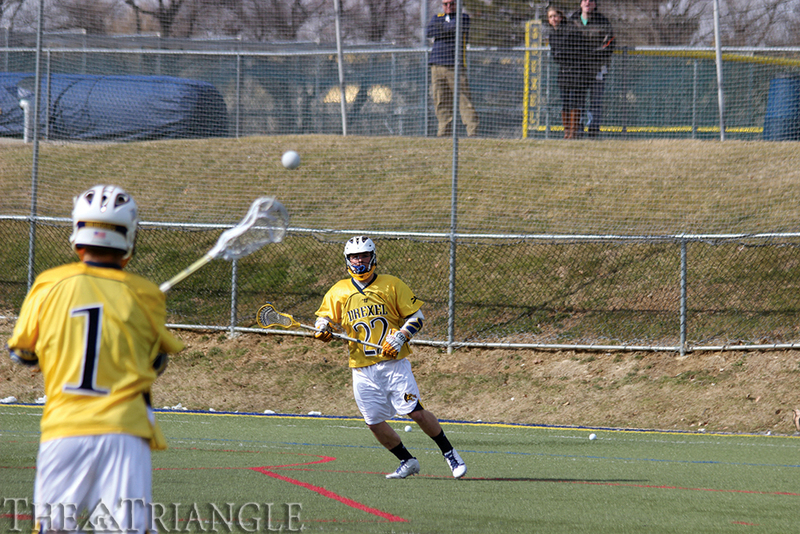 The Drexel University men’s lacrosse team knocked off Robert Morris University, 18-12, at Vidas Field March 1. The game began well for the Dragons, who pulled out to an early 2-0 lead after goals by freshman midfielder Nick Valentino and redshirt freshman attacker Cole Shafer. The Colonials responded before the end of the quarter, but Drexel outscored Robert Morris 5-2 in the second quarter with another goal from Shafer, two goals by senior attacker Nick Trizano, and goals from senior midfielder Ben McIntosh and freshman defender Jake Gennosa. The Dragons entered the locker room up 7-3, feeling confident and excited about the remainder of the game. An important aspect of the first half was the play of sophomore goalie Will Gabrielsen. Through two quarters, Gabrielsen racked up seven saves, only allowing three goals to the Colonials. He continues to impress the coaching staff, team and fans alike, and it’s showing in his increased playing time. While head coach Brian Voelker has been interested in giving both Gabrielsen and sophomore Cal Winkelman equal playing time, that plan has changed in three of the five games this season because of Gabrielsen’s extraordinary performance in the first halves. Though Gabrielsen played well in the first half, Voelker decided to put Cal Winkelman in for the second half, and he performed well. 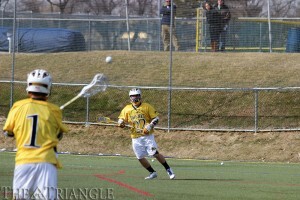 In the third quarter, the Dragons allowed four goals, including one with no time remaining on the clock. They also scored three of their own, with McIntosh getting his second and Shafer netting his third and fourth of the game. The fourth quarter started with Drexel leading 10-7 before a goal by junior midfielder Ryan Belka extended the lead to four under a minute in. A quick goal by RMU’s JonPatrik Kealey cut the lead to three before Shafer scored his fifth goal of the game to give the Dragons a 12-8 lead. Shafer has been huge in his first season on the field for the Dragons, leading the team in points with 16 goals and 10 assists through five games. His contributions have been gigantic for Drexel, especially as they try to fill the hole left by Robert Church, last season’s points leader on the team. Voelker expected Shafer to be an important piece of the offense this year, but maybe not to this extent or this early in the season. Following Shafer’s goal, RMU went on to score four of the next six goals to cut the Drexel lead to two with five and a half minutes remaining. But the Colonials weren’t able to keep up that offensive output, as Winkelman stepped up and made some key saves. The offense scored four more goals to end the game with a Drexel victory, 18-12. Following the win against Robert Morris, the Dragons hosted No. 11 St. John’s University March 4. The Dragons got out to a rocky start, ending the first quarter down 4-3 with their three goals coming from McIntosh, junior attacker Mitch de Snoo and sophomore Jules Raucci. In the second quarter, the Dragons’ offense exploded. For the first 14 minutes of the quarter, they held St. John’s scoreless and tallied seven goals of their own. Shafer netted three goals and Trizano, McIntosh, Valentino and senior attacker Jared Boudreau each scored goals of their own. St. John’s managed to net two goals before halftime, but the Dragons still went into the second half leading 11-6. The third quarter was fairly uneventful, as both defenses and goalies were in top form and St. John’s managed to net two goals to just one from Drexel. The fourth quarter began with a goal from Trizano to extend the Dragon lead to 13-8. St. John’s scored three quick goals to cut the lead to 13-11, but their run came to a halt when Shafer scored twice near the end of the game, putting the Dragons safely out of reach. Shafer finished the game with five goals. Voelker decided to keep Will Gabrielsen in goal following a dominant first-half performance and the decision paid off. Gabrielsen only allowed 11 goals in the entire game with 13 saves, including a few crucial saves near the end of the game to stop the St. John’s comeback. An important, often overlooked aspect of both of these victories is the ability of Dragon junior midfielder Nick Saputo to win face-offs. Saputo has won 63.9 percent of his face-offs this season, meaning the Dragons start with the ball more than their opponents, allowing them to have more possession and score more often than their opponents. Voelker appreciates the work of Saputo and its importance to the offense and team in general. “Nick Saputo has done a very good job and his performance allows us to play make it, take it, of sorts, on offense and score repeatedly without giving up possession,” he said. The Dragons are now 3-2 and play next at Bryant University March 8 at 1 p.m.